I'm wearing a really poofy shirt today. It caught the attention of my co-worker and I got some good natured ribbing. 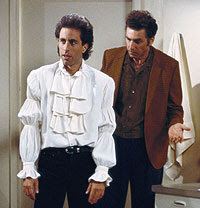 It quickly became called "the pirate shirt," a Seinfeld episode reference. He claims this is what the shirt looks like, from this site.